In the place we used to live in near High Park, we used to have cable. When we moved into our new home, we opted out of paying for cable and watched whatever we could pick up from the analog feed to our house. The TV we had was not the greatest and picked up a small number of channels (most of which were fuzzy). Even though this wasn’t the greatest option, we didn’t mind as our TV wasn’t awesome and wouldn’t take advantage of the Holy Grail that is HD. Fast forward a few years and the TV started to show its age; we finally ended up getting a new TV (more at my insistence). Due to me getting my wish, Mrs. J made a simple ask: CTV (which never showed up using cable or a simple antenna using our old TV). 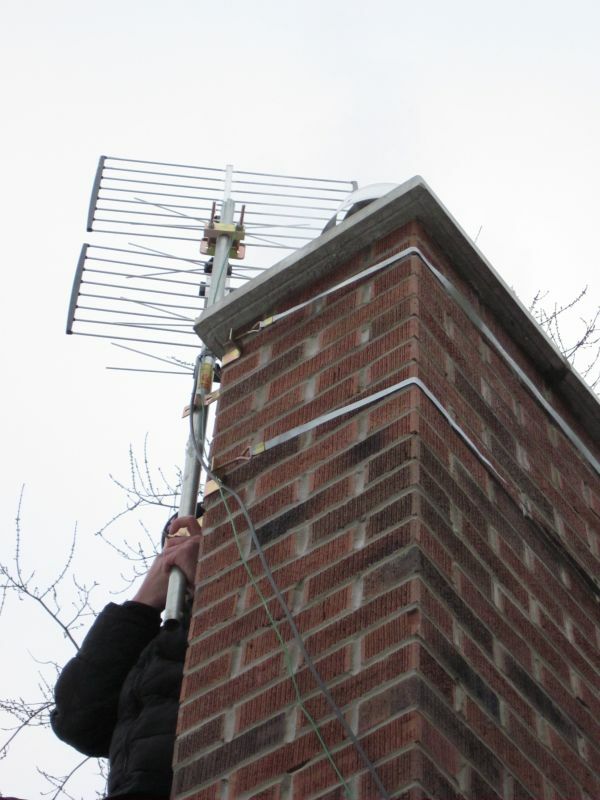 The decision was made to get an antenna that would allow us to pick up digital signals. Due to my fear of heights and the fact that I had no idea how to install one, we decided to call some professionals. Geoff does some prep work. 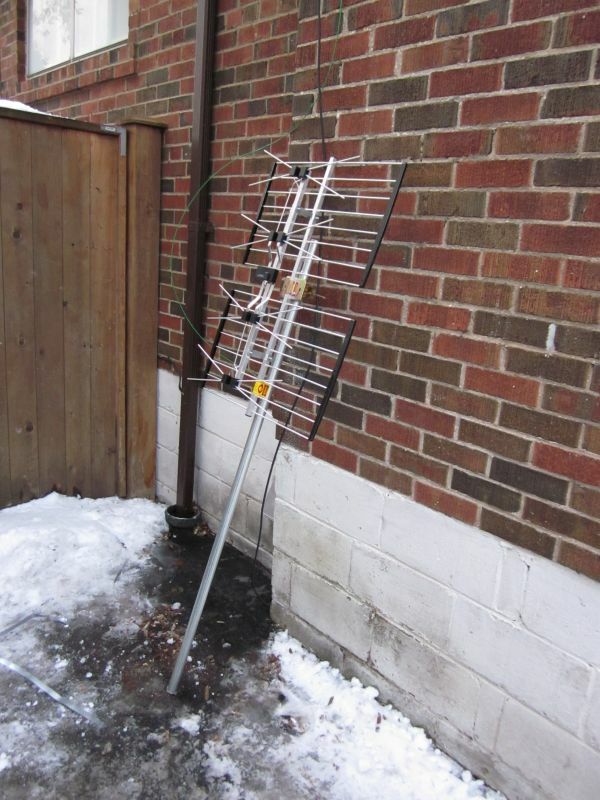 A friend of Mrs. J’s sent her an article about getting HDTV channels using an antenna, and had a helpful link to company called The Antenna Guys. It is a small operation (based in Toronto) made up of a few guys that will come to your house and install a Channel Master antenna (or another one available from their inventory listed on their home page) and wire it to your distribution point so that you might be able to take advantage of the airwaves. 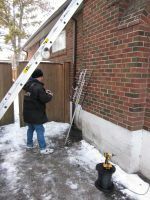 I spoke to Geoff (the owner) to get a quote and the cost of installation was relatively affordable (they even take off $25 if you provide a ladder and are easily reachable by TTC). Really, when you think about it, if you’re not really a specialty-channel-kind-of-person, you’re really doing yourself a disservice by buying basic cable, especially considering the fact that a lot of the channels that you watch are probably available using an antenna. 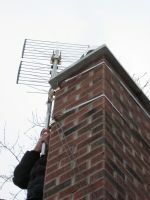 The one-time charge of installation of an antenna is recouped in a few months in terms of saving money by not paying for a cable provider for your TV. The Channel Master antenna and neat wiring. I touched base a few times with Geoff to make an appointment. Accommodating and polite, he explained what they did and we worked out a time when I would be home so they could do what they needed to do. 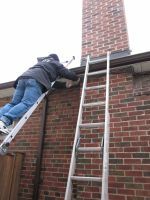 As his partner was riding a bike to get to our place, he did all of the prep work so that when his “climber” arrived, there would be no delay. Installation took a few hours (which was impressive considering how icy the roof was) and we received a decent number of HD channels which is impressive considering where we are located. One thing to keep in mind when working with The Antenna Guys: make sure you are explicit in how you want things wired; this is something that they appreciate. 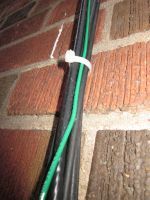 For instance, I asked Geoff not to anchor the cable he brought into the house (he had to drill in) so that I might have some slack to do some rewiring if I needed to at a later time. He did exactly as I asked, and left a good length of coil which I have stored in my laundry room. Antenna mounted and pointed towards the CN Tower. 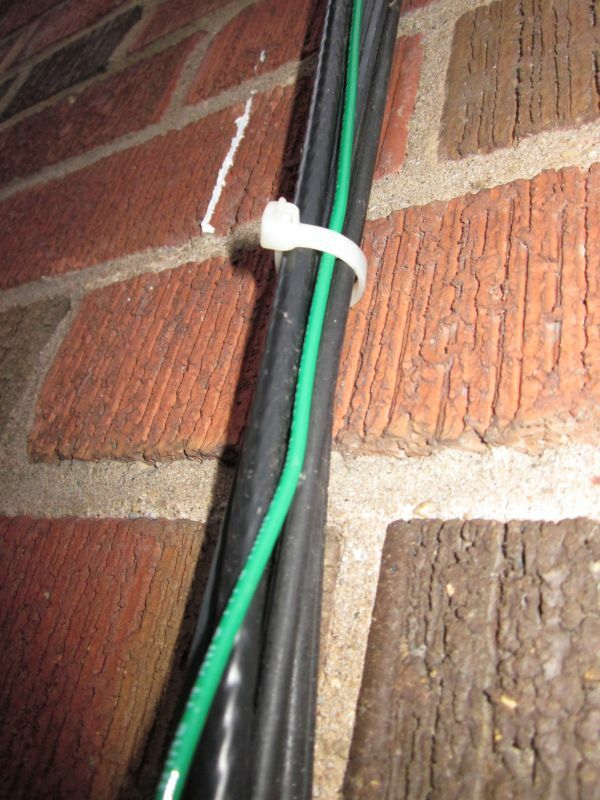 Another awesome thing they did: fixed up the wiring outside the house. Geoff tie-wrapped and straightened a lot of the messy wiring job of previous folks. He even left me extra caulking to plug up some of the other holes that he found that had been drilled before he got there. 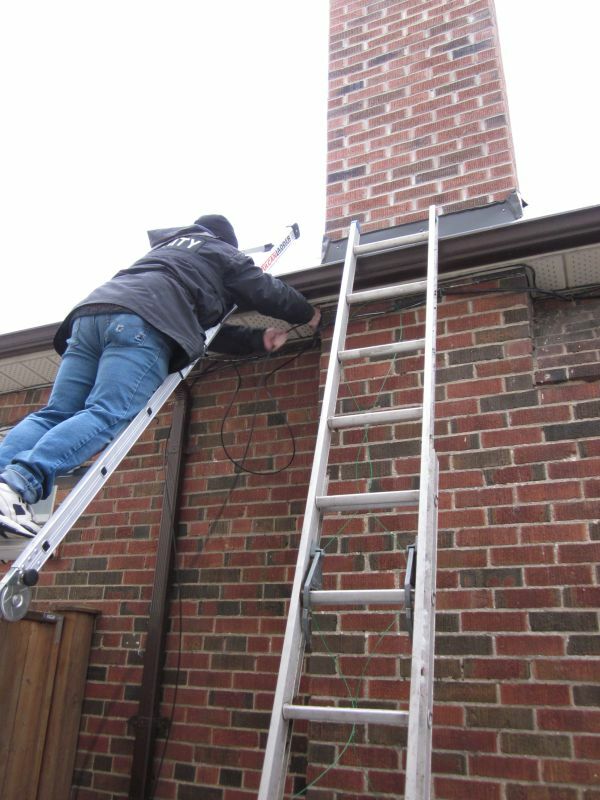 The Antenna Guys are a great group of dudes who will help you unshackle yourself from the expense that is cable and reap the benefits of free off-the-air digital signals. I would recommend these guys to anyone interested in this kind of thing. 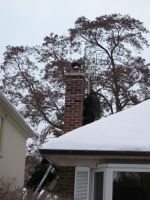 Geoff is a salt-of-the-Earth kind of guy whose business is in its infancy and he could use the support of word-of-mouth advertising; if you or anyone you know is thinking about going aerial, check out their web page.